The first weekend of this year is here and before we know it the whole month of January will have passed by us. I have been thinking about what kind of dishes I am going to cook this week and hopefully post on the blog too. I have a few draft posts that I must post first though. Picking from the list was a tough job as I have many recipes that didn’t quite make it to the blog during the festive Christmas season that has just passed by us. 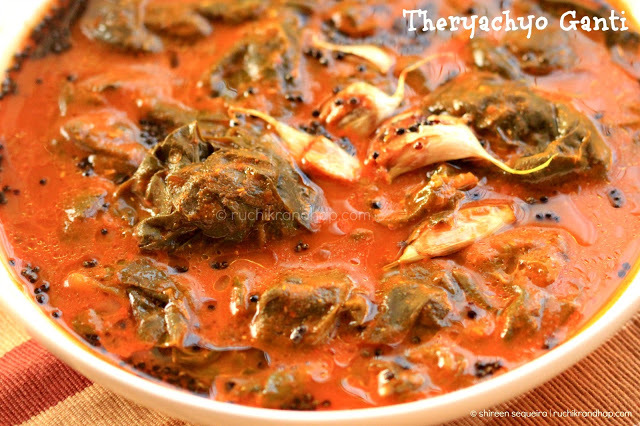 Popularly known just as ‘ganti’ this dish involves knotted leaves cooked in a spicy onion based gravy. Sounds interesting? I found it pretty fascinating when I heard about it too. Whoever thought of cooking the leaves in such a fashion needs to be given an award for his/her creativity. 1. Open the leaf 2. Start rolling it from one edge 3. Roll it into a cylinder 4. Tie a knot 5. Be careful not to tear the leaf 6.Knots left to wilt at room temperatureColocasia is probably one of those plants that are completely edible – from tip (leaf) to toe (root). While the leaves and stem are more popular in the cuisines down South, the root, popularly known as ‘Arbi’ in Hindi are cooked with much passion across North India. Mangalore has its own favourite way of cooking this plant. The leaves find themselves in a popular seasonal dish called the pathrade/pathrode where they steamed along with rice batter & spices. The stem is peeled and made use of in a curry – usually given as one of the confinement foods to a new mother to help nurse her body back to health. 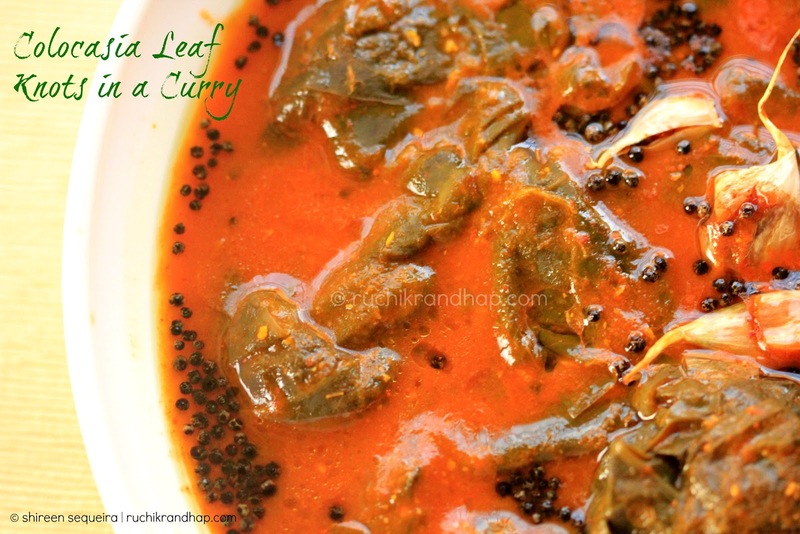 Today’s dish is a simple curry made of spices in which knotted leaves are cooked. This dish has a special tang that makes this curry finger licking good. Do note that colocasia has varieties, the one with pink spots is not edible apparently. The edible varieties are the one used to prepare pathrade/pathrode that has darker leaves and dark stems and is know as Alloom (Allu) in Konkani. The other edible plant is the one with light green leaves and stems and is called as Thereim (Therey). They are interchangeable for the preparation of this dish. I do hope you are able to find the leaves and prepare this delectable traditional dish. 1. Wash the leaves thoroughly and gently pat them dry. Keep in a cool place of your kitchen for a day so that they wilt. The next day, roll each leaf across its breath (starting from one edge) and tie into a knot carefully. 2. Using a little water, grind all the ingredients mentioned under ‘For the masala‘ to a fine paste. Retain the masala water from the mixie. 3. Place the knots in a pan and add sufficient water to cover them. Bring the water to a boil and cook for a couple of minutes before adding the ground masala and its water. Adjust the consistency of the gravy and add salt to taste. Thats true, Many delicious, traditional dishes are vanishing over a period of time. This gravy looks delicious and very new to me. This is a popular dish in my MIL's place. It's called 'Kesuvina Kotla' in Kannada. Like you I too heard, saw and tasted this curry after I got married. Wow, this is something so very unusual. Will definitely try. A question (!). In the description, you have mentioned spicy coconut based gravy. But I don't see coconut in the ingredients list. Is coconut to be included? Thanks Uma, Binny & Sumana! Good to hear about Kesuvina Kotla Sumana..do u have a recipe of that? @ Anonymous: Thanks! It was a typo actually…I was multi tasking with recipes and instead of writing it as 'onion based gravy' I wrote 'coconut based gravy' – sincere apologies, the post stands corrected now! Never had a chance to try this colocasia leaves in my cooking, wonderful looking curry.